Here are three obituary/newspaper item statements about the same person, from two different newspapers on the same day. Which one do you like best? They are all different to some degree. Alfred Paul Bayly, 75, of 851 Thistle St., a retired iron molder died Wednesday. Born in San Francisco, he had lived in Seattle 41 years. 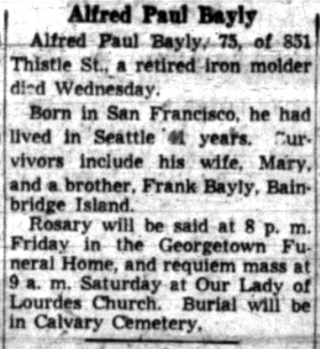 Survivors include his wife, Mary, and a brother, Frank Bayly, Bainbridge Island. Rosary will be said at 8. p.m. Friday in the Georgetown Funeral Home, and requiem mass at 9 a.m. Saturday at Our Lady of Lourdes Church. Burial will be in Calvary Cemetery. Seattle Post-Intelligencer, Seattle, Washington, 2 March 1951, page 21, column 5. Rosary for Alfred Paul Bayly, 75 of 851 Thistle St., will be said at 8 o’clock tonight in the Georgetown Funeral Home and Requiem Mass at 9 o’clock tomorrow forenoon, in Our Lady of Lourdes Church. Burial will be in Calvary. He died Wednesday. 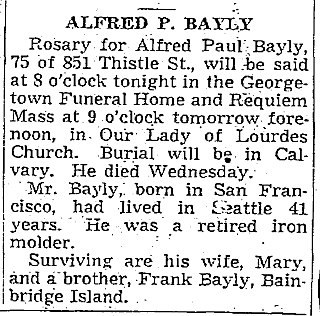 Mr. Bayly, born in San Francisco, had lived in Seattle 41 years. He was a retired iron molder. Surviving are his wife, Mary, and a brother, Frank Bayly, Bainbridge Island. Seattle Times, Seattle, Washington, 2 March 1951, page 40, column 7. BAYLY – Alfred P., Feb. 28, at 511 Thistle Street, age 75 years. Beloved husband of Mary L. Bayly. Brother of Frank and George Bayly. Rosary Friday (today), 8. p.m. from Chapel Georgetown Funeral Home. Requiem High Mass Saturday, 9. a.m. from Our Lady of Lourdes Church. Interment Calvary. Seattle Times, Seattle, Washington, 2 March 1951, page 40, column 2. The brother, Frank, appears in all of them, but George in only one. In a fourth item, from the P-I, he also appears; but I didn’t post it because the image I have is too dark. Posted on 26 August 2012 25 August 2012 by N. P. Maling	This entry was posted in Family History, Newspapers and tagged newspaper obituaries, Seattle Post-Intelligencer, Seattle Times, Seattle Washington. Bookmark the permalink.